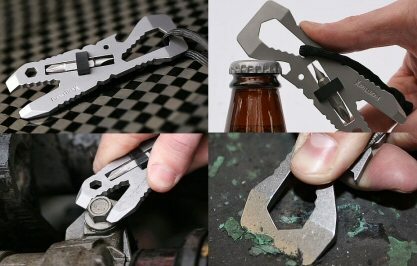 Pocket Tool X makes some cutting edge, high quality multi-purpose pocket tools so when we saw the new Piranha tool we had to present it to you. As you can see from the picture above this multitool by Pocket Tool X means business and doesn't just swim with other piranha it's an alpha piranha and by piranha we mean multitool. It's a great fit in anyone's Every Day Carry war chest. The Piranha does have some impressive qualities and specs for example its single piece design is fashioned out of heat treated corrosion proof 420 stainless steel. That's alpha quality. It can be used as a wrench with six standard and five metric sizes. It has a hardened steel Philips/flat head screwdriver covered in a rust resistant black oxide. I would have to say for small jobs it accomplishes a lot and it could replace a ton of bulk in your EDC pouch.